Ovah Coffee: The Lamp Quest Is On! The Lamp Quest Is On! After spending some time to look around our apartment, my boyfriend and I have gotten to a conclusion that we definitely are in need of two new floor lamps [one each for the bedroom and the living room] and one or two desk lamps that we can place by our living room windows. Considering the fact that we do not live in a very spacious flat, we are looking for floor lamps that have a fresh look and will not eat up so much floor space. After Googling around a bit, we've spotted the Low-Voltage Halogen Floor Lamp From Destination Lighting [http://www.shopwiki.com/wiki/Low+Voltage+Halogen+Lamps; please refer to the photo to your right] which will surely look great when placed in one corner of the living room. It's slim which is what we just need with a simple but nice design. I absolutely like the idea that both the height and arm of this lamp are adjustable --- perfect for my reading nights! Maybe, just maybe, this is what we'll also be getting for our bedroom. For the desk lamp, we want something that has fancy designs on it. We'll be placing the lamp/s by the glass windows to give the living room a classic touch. 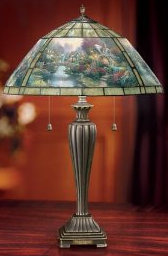 I like I WANT the Thomas Kinkade's "Lamplight Bridge" Stained-Glass Table Lamp [please refer to the photo to your left]. The handcrafted glazier of the shade and the classic broze-finished base work well together. This desk lamp will absolutely give our livingroom a more cozy look especially during those relaxing evenings. We are thinking of getting two of these. We'll see! Oh... I just love shopping! The lamp quest is on!